 The College of Arts and Sciences is the largest division and the academic heart of The University of Alabama, offering the foundation disciplines on which all others depend. There are approximately 8,400 undergraduate students and 1,000 graduate students in over 100 programs of study across 64 fields spanning the arts, sciences, and social sciences. The College offers 19 academic programs that aren’t offered anywhere else in the state. Internationally recognized scientists, writers, artists, and scholars teach in Arts and Sciences classrooms and labs. Our students work closely with professors who are not merely experts in their disciplines, but also creators of new knowledge. Nearly a third of our undergraduates work on independent research and creative projects under the guidance of faculty mentors. The College is one of the oldest and largest liberal arts colleges in Alabama and among the finest in the region. It is recognized nationally for the number of undergraduate and graduate students who receive national awards and scholarships. From student achievements to enrollment trends, see the College of Arts and Sciences through its impressive facts and figures.